Academia was not always on Jo’s agenda but when Jo had her son, she took a break in her career as a make-up artist. As soon as her son was old enough she was ready for a new challenge, and she has not regretted her decision to come to LSBU to make it happen. Jo's interest in criminology stemmed from reading and watching news stories within her local community. As part of her local community, which is a melting pot of cultures, and communities, Jo wanted to better understand how society has evolved and to understand the underlying issues around why people commit a crime. She jokes it was not the CSI TV show that inspired her to study, which is often what attracts people to the course, but she was looking more a grounding in reality. Jo reactivated a dormant criminology society in her second year and since then it has gone from strength to strength. The criminology society now organises weekly events, which range from film screenings, employability events, museum visits, and even 'murder mystery' events. However, it does not stop there; Jo has also collaborated with other members of the society to record podcasts and works with other universities to develop volunteer programmes with local prisons. Jo has, needless to say, put her whole heart into her time at university in both her studies and extracurricular activities. Jo Lear has made the most of her time at LSBU, and this extends outside of the classroom too. Jo volunteers at Pentonville Prison once a week and volunteers as a teaching assistant where she guides the room and facilitates classes. “This can at times be very challenging as you are often dealing with individuals who might have been in lockdown for long periods of time. However, I do find it rewarding and it is something that helps me understand what I read about during my studies. I recently helped organise a conference on the current policy surrounding prostitution in collaboration with one of our lecturers, which was fascinating and provided a unique opportunity to engage with our studies on a different level. 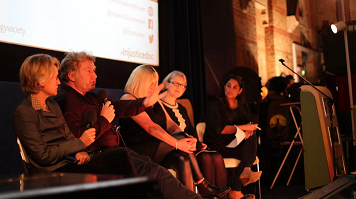 "Along with this, the society organised a premiere screening of Injustice at London South Bank University, which was created by a former prisoner, and which was a sold out event. "Finally, my co-president of the Criminology Society and I are starting a social enterprise which aims to support criminology and social science students nationwide by providing invaluable networking opportunities. We were recently accepted on to the Student Enterprise course, SPARK, and successfully pitched to win funds to test our idea in the market. Whilst I’ve enjoyed many other things at LSBU, I won’t forget Helen Easton, Edwin Shaw, Julia Shaw, and Keri Baker, all of whom were excellent teachers and helped me through my time here." Whilst Jo is looking to continue her social enterprise to potentially create a successful business, she’s also looking to continue her studies with a masters, and will continue her volunteer positions, which she finds highly rewarding. Jo has experienced first-hand how friendly and diverse LSBU's student body is, and has met some amazing people who will be friends and colleagues for life.